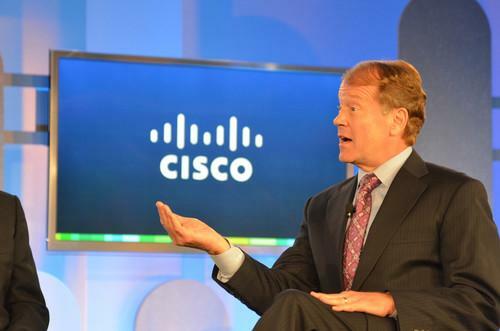 Cisco Systems Chairman and CEO John Chambers. Cisco plans to invest US$10 billion in China, although its sales in the country are slumping due in part to persistent security concerns surrounding U.S. technology. The investment marks a "new chapter" for the company, and it includes agreements with the Chinese government to expand in areas including research, and job creation, Cisco said on Wednesday. The $10 billion investment will be made over several years, and will help spur technology innovation in the country, Cisco said, without further elaborating. It called the move a "renewed commitment" suggesting that the investment would be added on top of its existing operational expenses in China. Cisco could not be immediately reached for comment. As part of the investment, the company has signed agreements with China's National Development and Reform Commission, a high-level government agency, and with an association connected to the Ministry of Education. Cisco has been in the Chinese market for over two decades supplying networking equipment, including what's used in the country's Internet infrastructure. But its business in the country has struggled in recent years due to "geopolitical challenges", according to the company. Following leaks about the U.S.'s secret surveillance programs, China has made cybersecurity a priority. As a result, the country is considering stricter regulations that could push U.S. tech firms out of the market. In Cisco's case, it also had to contend with competition from Huawei Technologies and ZTE, two Chinese companies that have become major players in the networking sector and are moving into enterprise services. But even as China focuses more on cybersecurity, Cisco said on Wednesday it's committed to the market. The company announced the investment as both its outgoing CEO John Chambers and incoming CEO Chuck Robbins met Chinese government officials. Cisco will continue to "work closely" with the Chinese government and its partners to better meet demands for the market, Cisco's head of the Greater China Owen Chan, said in a statement. Back in 2007, Cisco made another huge investment in the country that reached $16 billion. Most of the money was geared toward doubling its manufacturing. The market opportunity in China is huge. The country has over 600 million Internet users, and there's a growing need for more data centers, and faster networking infrastructure.